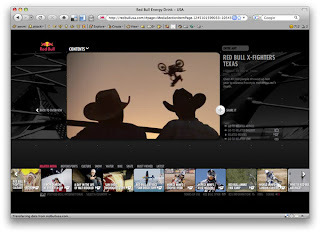 Where the previous entries in the energy drink topic felt frenetic and chaotic, Red Bull is more refined and focused. 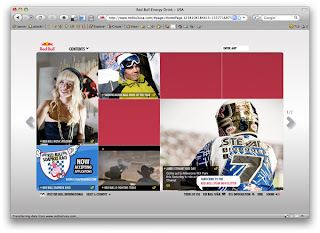 Like it's competitors Red Bull is involved in everything from bmx, video games, to break dancing teams. Navigating between info and video content on these areas is through a simple Flash interface that keeps the amount from being overwhelming. The videos are indexed and set up to make it easy to actually watch them. Other than that there isn't much to offer. There isn't a Red Bull community here, but there is definitely a presence on the major channels.